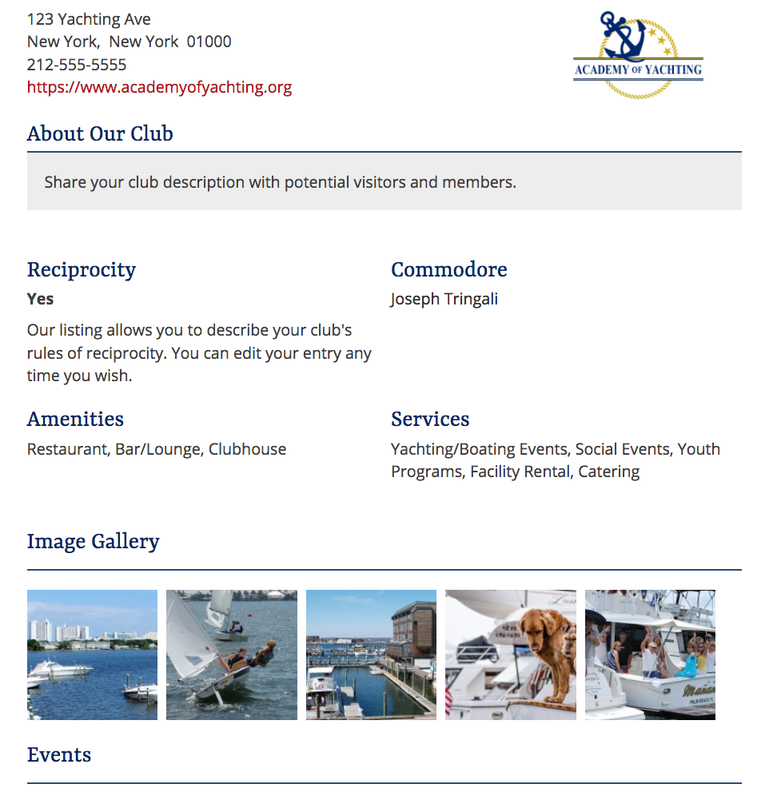 On this page you will find “Members Only” goodies for you to sample: a downloadable ceremony script with diagrams, FAQs about yachting and yacht club protocols, an expanded club listing, and discounted books and Academy courses. 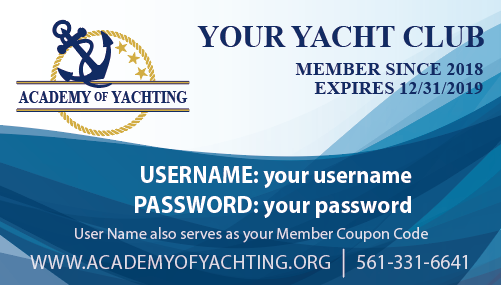 Members also receive wallet-sized, full-color, membership cards for 50 members of their club or squadron (more upon request) with Academy login and coupon codes for members’ use. The members’ expanded registry listing can be edited only by the club or squadron’s designated admin contact. The admin receives a special login that allows the club’s listing to be updated at any time. 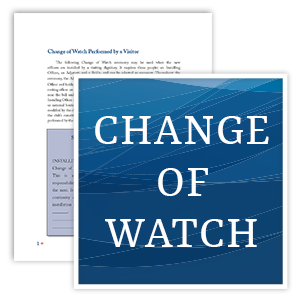 If you change your reciprocity rules, you don’t have to wait for the printed version of the registry – your changes are online and visible to the public immediately. Update images, events, or the description of your club any time you want. Check out these samples to see how the Academy will be the only resource your club or squadron needs. If there’s one ceremony performed by almost every yacht club, it’s the yearly Change of Watch. P/C Joe Tringali has written the only script you’ll ever need for your C.O.W. This definitive 20-page guide features detailed diagrams and two scripts – one for a ceremony performed by a visiting dignitary and the other for a ceremony performed by the commodore. Both scripts make it easy for your club to enjoy the day without the worry of where to stand or what to say. It’s all in this script! Q Why is the US Flag flown under the Marina flag? The following question was forwarded by the National Headquarters of United States Power Squadrons with a request that we—once again—explain why the United States flag sometimes appears “lower” than another flag. If you’re suggesting that a marina flag was flying above the United States flag on the same hoist (i.e., “flagpole”), you are perfectly justified in having a fit! The same is true if the flagpole in question has a single yardarm and the National flag was placed at the yardarm rather than the peak. Please let me know where such abominations are taking place, and I’ll personally have a polite but firm chat with them. On the other hand, if you are saying the United States flag was physically lower than another flag, well . . . that’s another story. So, once and for all, let’s settle the question of what, exactly, is the “highest point” for our Nation’s flag in a Maritime location. If the flag display had a gaff, that is a spar running upwards at a 45 degree angle off the rear of the display, then, by very long standing naval tradition THAT is the PLACE OF HONOR where a nation’s colors are hoisted—and, by the way, that practice is followed by every nation in the world. Onshore nautical installations such as Naval installations, Coast Guard bases, yacht clubs, marinas, and, yes, even the United States Naval Academy at Annapolis all follow the naval protocol. You may have heard that the United States Navy consists of “200 years of tradition with no forward progress.” Obviously, that’s an overstatement in many areas, but it’s absolutely true when it comes to subjects like “wearing” the United States ensign. In short, it’s the place of honor that counts; not the physical height of the flag. Our educational workshops, seminars and presentations are available to the general public, but as a member club or squadron, your members receive substantial discounts on all fees. Also, Academy Clubs and Squadrons are invited to serve as hosts for workshops, seminars, and presentations. Call our office at 561-331-6411 to learn more about hosting an educational event at your venue.